If we identify strongly with the characters in some movies, then it is no mystery that “Casablanca” is one of the most popular films ever made. It is about a man and a woman who are in love, and who sacrifice love for a higher purpose. This is immensely appealing; the viewer is not only able to imagine winning the love of Humphrey Bogart or Ingrid Bergman, but unselfishly renouncing it, as a contribution to the great cause of defeating the Nazis. No one making “Casablanca” thought they were making a great movie. It was simply another Warner Bros. release. It was an “A list” picture, to be sure (Bogart, Bergman and Paul Henreid were stars, and no better cast of supporting actors could have been assembled on the Warners lot than Peter Lorre, Sidney Greenstreet, Claude Rains and Dooley Wilson). But it was made on a tight budget and released with small expectations. 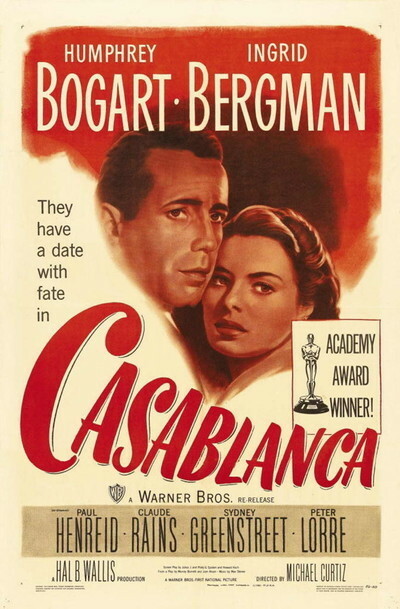 Everyone involved in the film had been, and would be, in dozens of other films made under similar circumstances, and the greatness of “Casablanca” was largely the result of happy chance. The screenplay was adapted from a play of no great consequence; memoirs tell of scraps of dialogue jotted down and rushed over to the set. What must have helped is that the characters were firmly established in the minds of the writers, and they were characters so close to the screen personas of the actors that it was hard to write dialogue in the wrong tone. Humphrey Bogart played strong heroic leads in his career, but he was usually better as the disappointed, wounded, resentful hero. Remember him in “The Treasure of the Sierra Madre,” convinced the others were plotting to steal his gold. In “Casablanca,” he plays Rick Blaine, the hard-drinking American running a nightclub in Casablanca when Morocco was a crossroads for spies, traitors, Nazis and the French Resistance. Then “of all the gin joints in all the towns in all the world, she walks into mine.” It is Ilsa Lund (Bergman), the woman Rick loved years earlier in Paris. Under the shadow of the German occupation, he arranged their escape, and believes she abandoned him--left him waiting in the rain at a train station with their tickets to freedom. Now she is with Victor Laszlo (Henreid), a legendary hero of the French Resistance. From a modern perspective, the film reveals interesting assumptions. Ilsa Lund's role is basically that of a lover and helpmate to a great man; the movie's real question is, which great man should she be sleeping with? There is actually no reason why Laszlo cannot get on the plane alone, leaving Ilsa in Casablanca with Rick, and indeed that is one of the endings that was briefly considered. But that would be all wrong; the “happy” ending would be tarnished by self-interest, while the ending we have allows Rick to be larger, to approach nobility (“it doesn't take much to see that the problems of three little people don't amount to a hill of beans in this crazy world”). And it allows us, vicariously experiencing all of these things in the theater, to warm in the glow of his heroism. In her closeups during this scene, Bergman's face reflects confusing emotions. And well she might have been confused, since neither she nor anyone else on the film knew for sure until the final day who would get on the plane. Bergman played the whole movie without knowing how it would end, and this had the subtle effect of making all of her scenes more emotionally convincing; she could not tilt in the direction she knew the wind was blowing. Stylistically, the film is not so much brilliant as absolutely sound, rock-solid in its use of Hollywood studio craftsmanship. The director, Michael Curtiz, and the writers (Julius J. Epstein, Philip G. Epstein and Howard Koch) all won Oscars. One of their key contributions was to show us that Rick, Ilsa and the others lived in a complex time and place. The richness of the supporting characters (Greenstreet as the corrupt club owner, Lorre as the sniveling cheat, Rains as the subtly homosexual police chief and minor characters like the young girl who will do anything to help her husband) set the moral stage for the decisions of the major characters. When this plot was remade in 1990 as “Havana,” Hollywood practices required all the big scenes to feature the big stars (Robert Redford and Lena Olin) and the film suffered as a result; out of context, they were more lovers than heroes. Seeing the film over and over again, year after year, I find it never grows over-familiar. It plays like a favorite musical album; the more I know it, the more I like it. The black-and-white cinematography has not aged as color would. The dialogue is so spare and cynical it has not grown old-fashioned. Much of the emotional effect of “Casablanca” is achieved by indirection; as we leave the theater, we are absolutely convinced that the only thing keeping the world from going crazy is that the problems of three little people do after all amount to more than a hill of beans.